Where are you feeling stuck in life right now? Job dragging you down? Having trouble finding the love you desire? Self-esteem issues eating away at your happiness? Just feeling blah? Wherever you are, I'll meet you there and work with you to identify your roadblocks so you can get back in motion on your path to wonderful. Pinpoint and chisel away at the belief systems that are keeping you stuck. Tap into your own inner brilliance to bridge the gaps between where you are today and where you want to be tomorrow. Create action plans to bring greater joy into your life and align your energy with what you want to attract. Strengthen your intuition and your ability to trust in your own voice. Find ways to enrich your life with more joy as you go about your day-to-day routine. All the answers are inside you and I can help you unlock them. I'm a faithful cheerleader and a tough love-giver—but I promise to make you laugh more than cry. I've helped clients move out of dead-end relationships, rediscover the happiness they once felt in their careers, develop new ways to cope with everyday stressors, and generally move to places of greater peace and happiness. 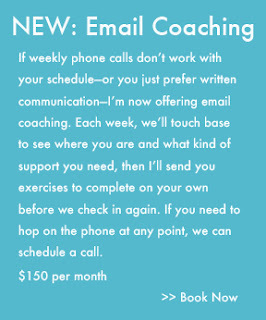 Each coaching session is done over the phone and recorded for your benefit. Recorded calls are kept 100% confidential and are emailed to you within 24 hours of your session. As a best practice, I generally recommend at least 6 weeks of work together to really set new ways of thinking and acting in motion. Please note: prior to beginning any formal coaching work, I require clients to do a 30-minute introductory call with me to determine whether we're the right fit. Interested in booking a private coaching party for yourself and your friends? I host lunch and/or dinner parties at my home in Santa Ynez, CA (with wine and cheese!) and can travel to the Los Angeles area if you prefer to host in your own home. Coaching workshop content can be customized to fit your specific group, and tailored to fit your desired time frame. Pricing is dependent on party duration. Contact me here with questions or to set up an info call. All posts copyright ©2013 Melissa Maris. Simple theme. Theme images by merrymoonmary. Powered by Blogger.